Just like Big Brother Canada 1, season 2 had more than its fair share of great moments that helped make it a great season to watch. Part of what makes Big Brother Canada great is the diverse cast, the twists, and how unpredictable it is. Below is part 1 of our 2 part flashback to a few of the most memorable moments from season 2. Let us know in the comments below, what your favourite memorable moments were from season 1 and 2. 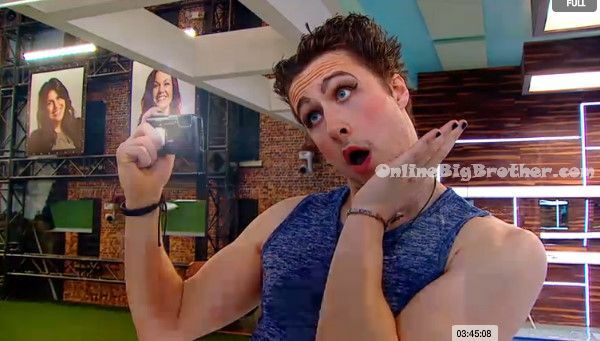 If you missed it, we also posted part 1 of the most memorable moments from Big Brother Canada 1. At just over a week into season 2 the producers turned a quiet morning on the live feeds into sheer pandemonium. The chaos began when house guest Ika Wong read the details of the hashtag challenge. The task challenged all the house guests to see which of them would be the most buzz worthy on twitter over the course of a 12 hour period. The winner of the hashtag challenge would be granted a special power. The power was later revealed to be a veto ticket where the winner could choose to remove another player from a Power of Veto competition, and play in their place. Adel was the most buzz worthy and he chose to keep the details of the power a secret from the house guests. He opted to lie about his power telling the house guests that he had won “Canada’s Veto” and that he had the power to veto a nominee. The threat of using his power was enough to allow Adel to escape being nominated during a time when he was being targeted. To view more videos of the hashtag challenge here is where it all started. Soon after chaos ensues and the 12 hour challenge continues until the winner is announced. The prize for winning the hashtag challenge allowed the winner Adel to compete in a veto if he doesn’t get picked to compete by removing 1 house guest and taking their spot. Knowing only he knew the true use of his power Adel lied to the other house guests telling them he received “Canada’s Veto” stating that the power allowed him to veto a nominee & name a replacement within a 2 week time frame. The other house guests left Adel alone fearing he would use the power and after the two weeks passed he ended up using the veto to take Allison’s spot in a veto competition. Fights inside the house are great on the live feeds as tensions rise and personalities clash. They’re like car crashes you can’t help but look. One such fight early on in the season was the fight between Ika and Heather. As Heather was one of the nicest people in the house at times it was difficult to watch her being picked on and ostracized. The Sabrina and Ika fight was really great to watch on the live feeds and we captured it all right here. Sabrina asks Ika why she bumped into her in the hall. Ika tells Sabrina to shut that F**K UP!! Ika tells Sabrina that she is lucky she won’t be here because she would put her a$$ up on the block so fast!! SHUT the F**K up!! You’re lucky I won’t be here! I will f**King do you and your pet in! Sabrina says are you threatening me! Sabrina says you’re embarrassing your children. IKA says SHUT THE F**K UP! SHUT THE F**K UP SABRINA!!! IKA tells Sabrina to walk her fat a$$ out of the room! Sabrina gets up and storms inside, and goes off about what just happened! Sabrina tries to get into the diary room but can’t. She starts to go upstairs and then stops to tell everyone about how Ika threatened her. Sabrina tells them about how Ika threatened her that if she stayed she was going to put her up on the block. Andrew tells her that if she believes she was threatened she should go into the diary room and tell them. Sabrina tells them that Ika told her to walk her fat a$$ out of the room .. Sabrina then yells I WAS A MODEL YOU F**KING WH*RE!!! Some of the best action on the live feeds happen when the house guests are provided with alcohol. Unlike Big Brother US where the producers who severely ration the amount the house guests receive, the Big Brother Canada producers provide enough alcohol to really get the house guests intoxicated. It always amazes me how some house guests lose sight that they’re playing a game for a lot of money and end up sinking their own ship because they’re judgement is impaired. After another night of drinking and while enjoying a backyard slumber party Allison ends up giving Andrew a H**d J*b. One of the best drunken moments was after a night of heavy drinking Allison goes on a drunken rampage and shows us why its not a good idea to get emotional while intoxicated. Allison’s drunken rampage. It wasn’t always Allison that went overboard on the alcohol, Jon also consumed large amount of liquor and provided hours of entertainment. Jon doing some of his best drunk strategizing. And then here – A drunk Jon tells Allison that when it comes down to it – “ONE HUNDO” he is going against Neda. Love them or hate them the Gremlins are entertaining and painful to watch all at the same time. One of the most disturbing gremlin antics was when Rachelle pee’d in the communal hot-tub and partner in crime Sabrina called her out for it and then they both remained in the pee-tub to stew. If that wasn’t funny enough Rachelle complained 3 days later that the hot-tub smells like chemicals. Then 10 days later after I’m sure Rachelle has been using the hot-tub as her own personal urinal it turns toxic. They decide the hot tub is too disgusting and climb out. What great BBCAN2 moments list would be complete without a Gremlin dance? The some of the house guests got called out by Canada for the bad habits they exhibited on the live feeds. A few of the house guests got called out for nose picking, swearing, cr*tch grabbing and exposing themselves inappropriately. As a result all of the house guests had to gather and sing O’Canada whenever instructed to by the producers. Arlie recites to the other house guests a poem he made up about going into the big brother house. After he’s done the house guests go nuts about how amazing it was. Adel says it was the sickest poem he’s heard in a long time! Thanks! And that’s just part 1 … I’ve got a few more surprises in part 2 ..
Ika is so crazy, but I can’t stop liking her. Have to be proud of my country. There are so many drunk ramblings, that it is so embarrassing. I am shocked that there was no moments of Paul here yet, since he was the Suzette in this season. The Gremlins were definitely far from entertaining.